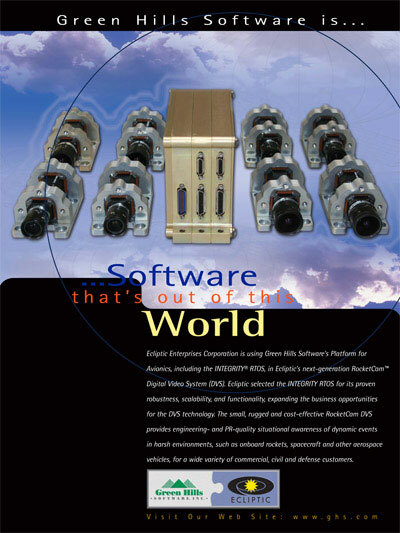 Ecliptic Enterprises Corporation is using Green Hills Software's Platform for Avionics, including the INTEGRITY� RTOS, in Ecliptic's next-generation RocketCam� Digital Video System (DVS). Ecliptic selected the INTEGRITY RTOS for its proven robustness, scalability, and functionality, expanding the business opportunities for the DVS technology. The small, rugged and cost-effective RocketCam DVS provides engineering- and PR-quality situational awareness of dynamic events in harsh environments, such as onboard rockets, spacecraft and other aerospace vehicles, for a wide variety of commercial, civil and defense customers.